When car companies portray life behind the wheel of a convertible, the ads typically depict attractive drivers motoring along the coast with the top down as the afternoon sun paints everything with a golden glow. And really, that's the whole point of getting a convertible, right? Pleasingly, the 2013 Lexus IS 350 C is capable of playing the starring role in those romantic al fresco fantasies. Like many in its class, the IS 350 C features a retractable hardtop that raises and lowers in about 20 seconds and does a good job of keeping both the elements and unwanted noise at bay. It also serves to deter thieving miscreants much better than traditional soft tops. Unlike its slightly more affordable sibling, the IS 250 C, the 306-horsepower IS 350 C has sufficient power to back up its racy looks. Further real-world appeal comes from a suspension that emphasizes ride comfort rather than sport and an interior replete with high-quality leather upholstery and a generous amount of standard equipment. That said, there are other picks for a luxury convertible. Buyers looking for more excitement will prefer the convertible versions of the BMW 3 Series or Infiniti G37 more. The Audi A5, meanwhile, lacks a retractable hardtop but its rear seat and trunk space are the least compromised in this segment. 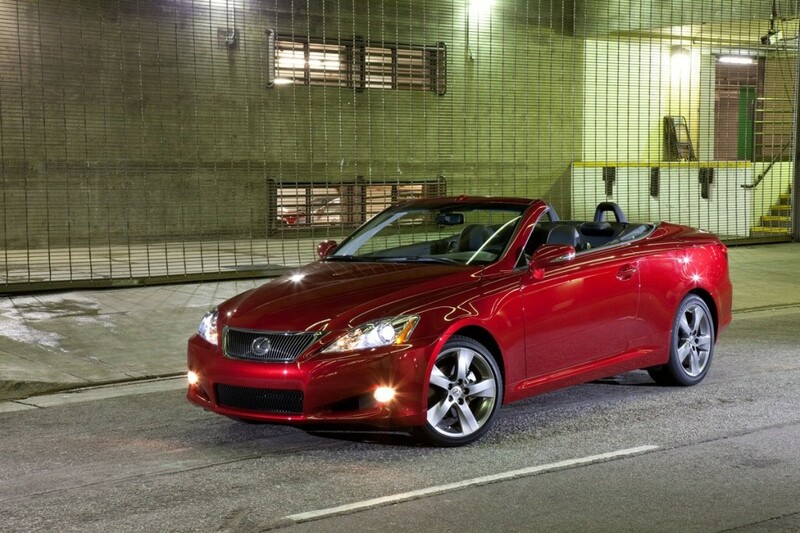 Overall, though, the 2013 Lexus IS 350 C should work well in your own unique convertible fantasies. The four-passenger 2013 Lexus IS 350 C is a retractable-hardtop luxury convertible offered in one well-equipped trim level. The smaller-engine IS 250 C is reviewed separately. Standard equipment on the IS 350 C includes 17-inch alloy wheels, foglights, heated mirrors with built-in turn signals and puddle lamps, keyless entry/ignition, dual-zone automatic climate control, leather upholstery, 10-way power front seats (includes two-way lumbar control), a power tilt-and-telescoping steering wheel and an auto-dimming rearview mirror. Also standard are the Safety Connect telematics system, Bluetooth phone and audio connectivity, and an eight-speaker sound system with a six-CD changer, satellite radio, auxiliary audio input jack and iPod/USB interface. The optional Luxury package includes bi-xenon headlights, rain-sensing wipers, upgraded leather upholstery, heated/ventilated front seats, genuine wood trim and driver memory settings. The Navigation package adds a navigation system, a rearview camera, voice commands, HD radio and Lexus Enform telematics features. A 12-speaker Mark Levinson surround-sound audio system can be added to the navigation system. Stand-alone options include parking sensors, adaptive cruise control and a pre-collision mitigation system. A variety of F Sport engine, suspension and brake performance parts, including 18- and 19-inch alloy wheels, are also available. The 2013 Lexus IS 350 C features a 3.5-liter V6 that produces 306 hp and 277 pound-feet of torque. Power is sent to the rear wheels through a six-speed automatic transmission that includes manual shift control. In Edmunds testing, an IS 350 C fitted with optional F Sport performance accessories accelerated from zero to 60 mph in 5.9 seconds. EPA-estimated fuel economy is 19 mpg city/27 mpg highway and 22 mpg combined. Standard safety features on the 2013 Lexus IS 350 C include antilock disc brakes with brake assist, stability and traction control, front-seat side airbags, front-seat knee airbags, front and rear side curtain airbags (unique among convertibles), pop-up rollover bars and Lexus Safety Connect emergency telematics. Included with the optional adaptive cruise control is the Lexus Pre-Collision system, which can snug the front seatbelts and activate brake assist immediately when the driver presses the brake pedal in situations where sensors detect an impending collision. In Edmunds brake testing, a Lexus IS 350 C (again with the F Sport upgrades) stopped from 60 mph in an impressive 111 feet. Inside the 2013 Lexus IS 350 C you'll find an attractive and well-stitched passenger cabin accented by top-quality materials. Gauges and controls are clear and intuitive, though models with the optional navigation system make it a little harder to get at touchscreen-controlled features like audio and climate settings while the nav system is in use. This year's navigation system does include the updated Lexus Enform service, however, which includes smartphone integration for apps such as Pandora, iHeart radio and Yelp. Up front, the seats offer good comfort and support and the power-adjustable seats and steering wheel make it easy to find an ideal driving position. Rear seat occupants are not so lucky, as this is one of the tightest backseats in the segment and therefore only really useful in a pinch. Trunk space is limited as well, with an adequate 10.8 cubic feet of cargo room with the roof raised and a paltry 2.4 cubic feet with the top down. That's enough for a modest-sized golf bag and not much else. Perhaps the most appropriate word to describe the experience of driving the 2013 Lexus IS 350 C is "refined." The body structure is solid enough to remain composed even over poor road surfaces, something not all convertibles can claim. The retractable hardtop enhances this feeling by minimizing noise levels and temperature extremes. The 306-hp V6 is noticeably more lively than the IS 250 C's smaller engine, making the 350 C the only choice if performance is important to you. Unfortunately, the suspension tuning favors ride comfort, which softens handling to levels that driving enthusiasts won't like. For drivers who require more performance, Lexus' lineup of F Sport suspension, brake and engine upgrades are available to help firm things up.